How wild are things going to get on a street that runs through the campus of a community college? There’s a pho place we like and I’m in awe of the Florida Room with the cryptic messages they leave on their marquee and that one bar, Ducketts Public House, looks like a place for an intense experience. We’re talking a completely different kind of wildlife. It may just be a coincidence and not a homage to any real animals that roam up and down Killingsworth St. because I have never seen any. 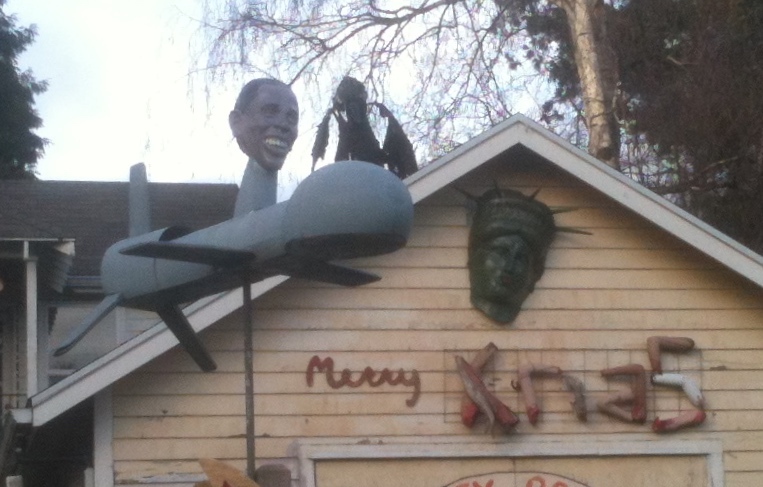 I noticed a theme of sorts on Killingsworth that has to be more accidental than planned. It first became apparent with Elk Cleaners & Laundry. 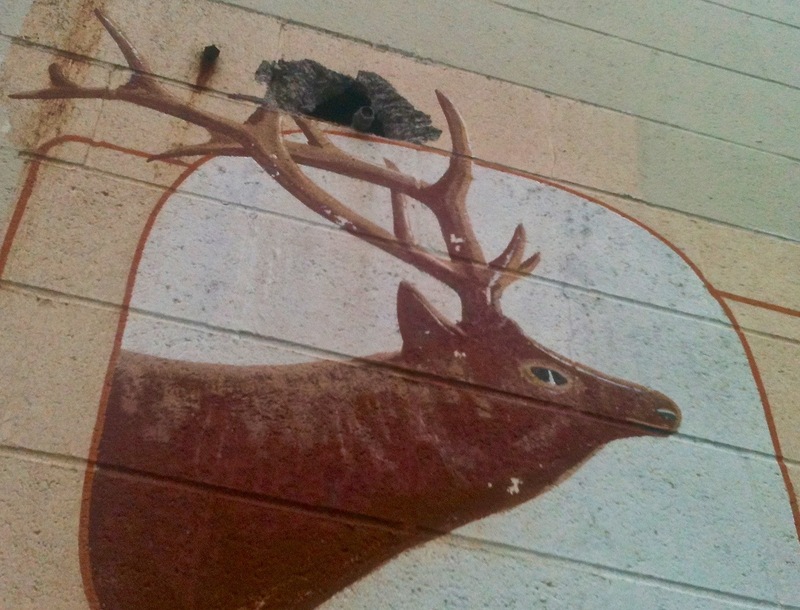 The business is named for animals that haven’t roamed this part of town for hundreds of years, if they ever did, and has a mural advertising what is now a defunct dry cleaners and laundry operation featuring the portrait of an Elk trophy head. 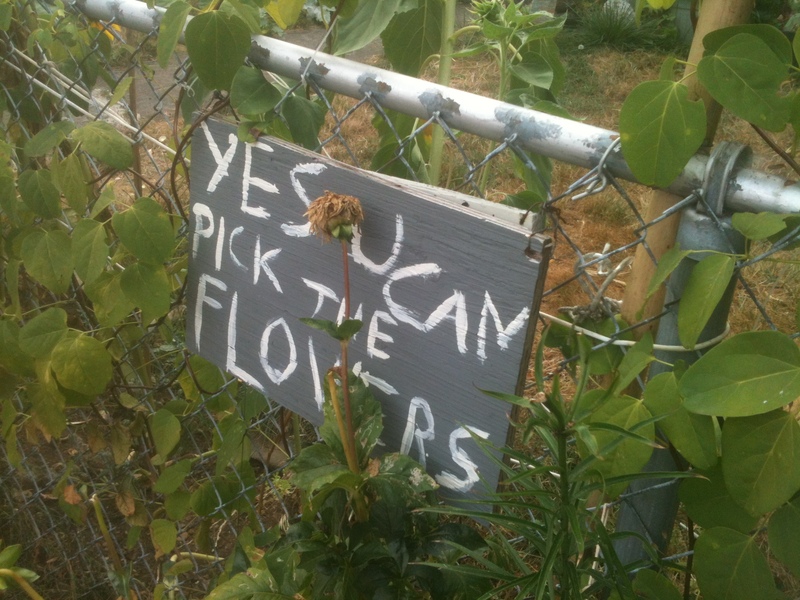 More evidence of demise is the obscured phone number at the bottom of the sign. I’m glad to see the mural/signage remains. 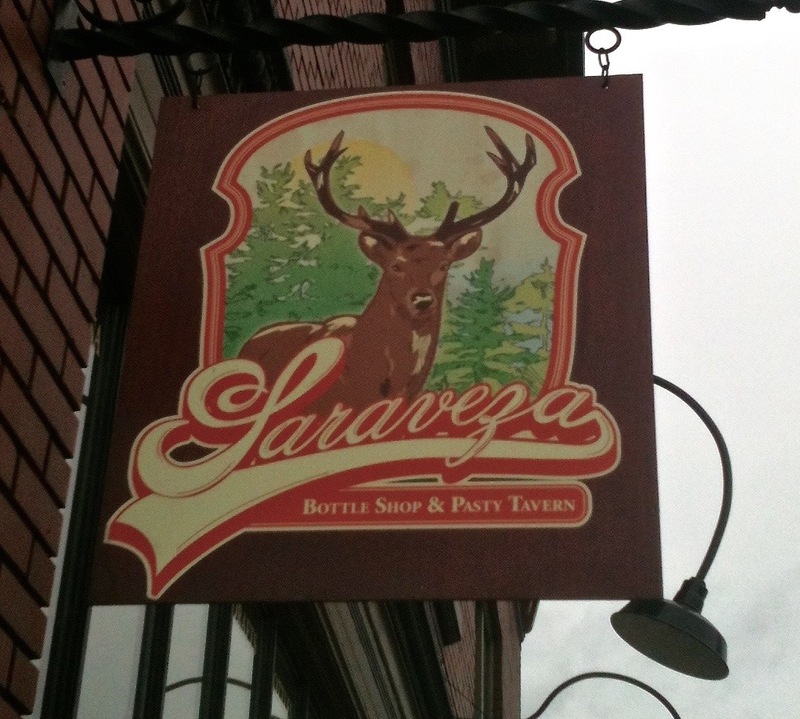 On the same block, a mature buck deer graces the sign of the Saraveza Bottle Shop and Pasty Tavern. The sign is a beautiful thing, majestic in it’s animal choice, portraiture and woodsy feel from the background design. How the deer works with the bar known to be a Packer fan hang out, I’m not sure, but it fits in well with the remains of the Elk Cleaners a few steps away. It does prove that a handsome animal will improve any sign. 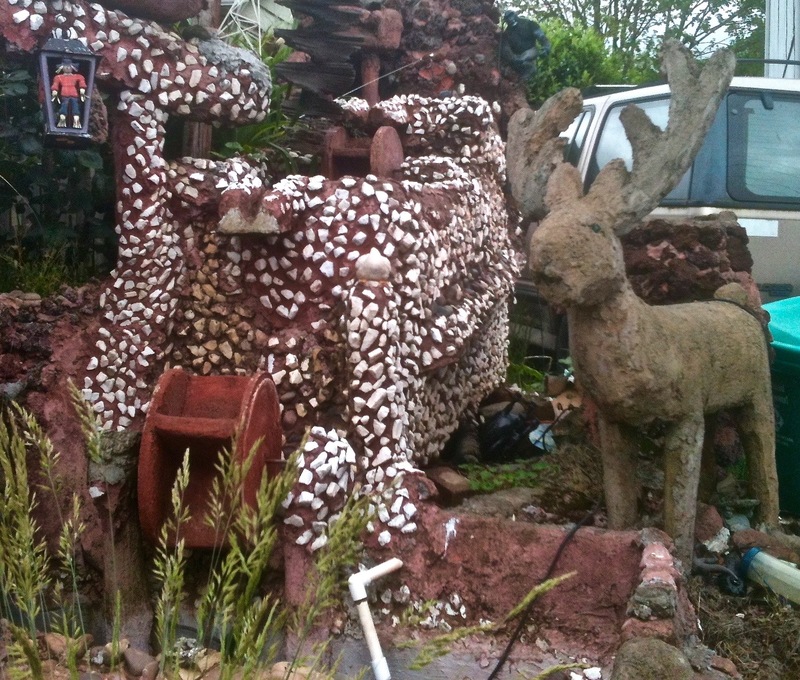 My favorite wildlife sighting, and the last one on this tour, remains up the road around 42nd Ave.
It’s a cement deer with wide antlers and a beat up face that I’ve always appreciated for it’s folk art and outsider art appearance. 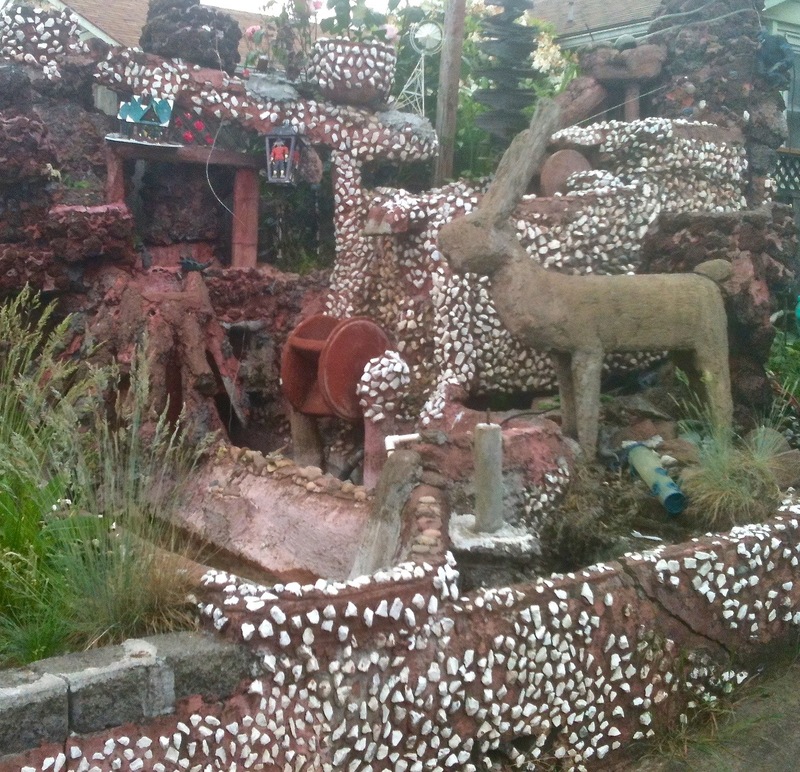 My assumption had been that the fountain design was made from white shells, but it’s only rocks that look like shells from a distance. All the times I drove past the deer’s habitat, I never realized he was posing next to a fountain until I got close enough to take his picture. Sadly it was not operational at the time of my visit. So there you have many a wildlife tribute on the not so wild street of Killingsworth. Then again it’s not such a dull street. It did have a Minus 5 album named after it. 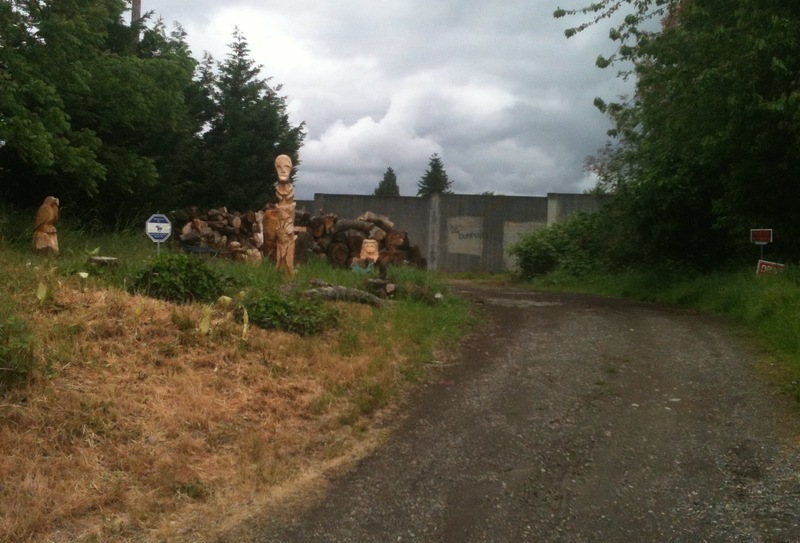 In a quiet neighborhood a block away from the bustle of the Interstate Fred Meyer lies something usually found in rural areas of the state. 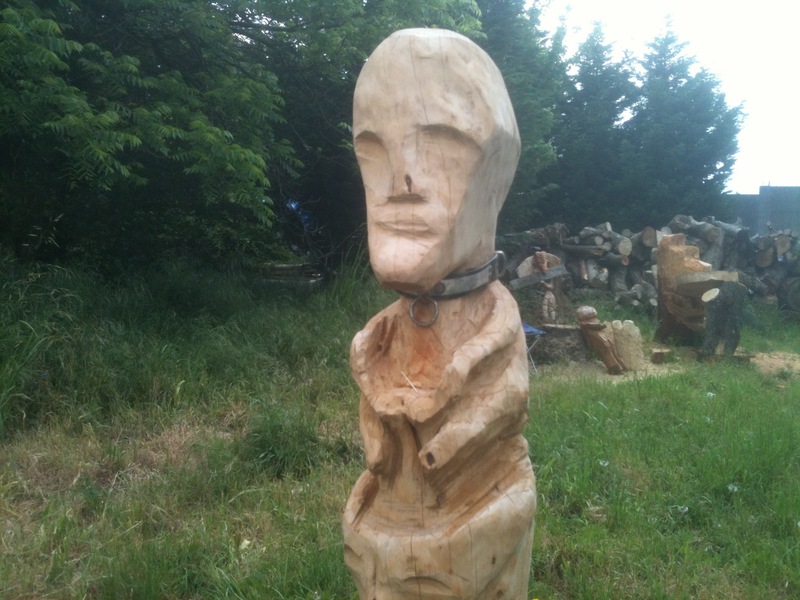 On a gravel pipestem driveway with scraps of trees as a border stand various log sculptures in an array of configurations and stages of completion. 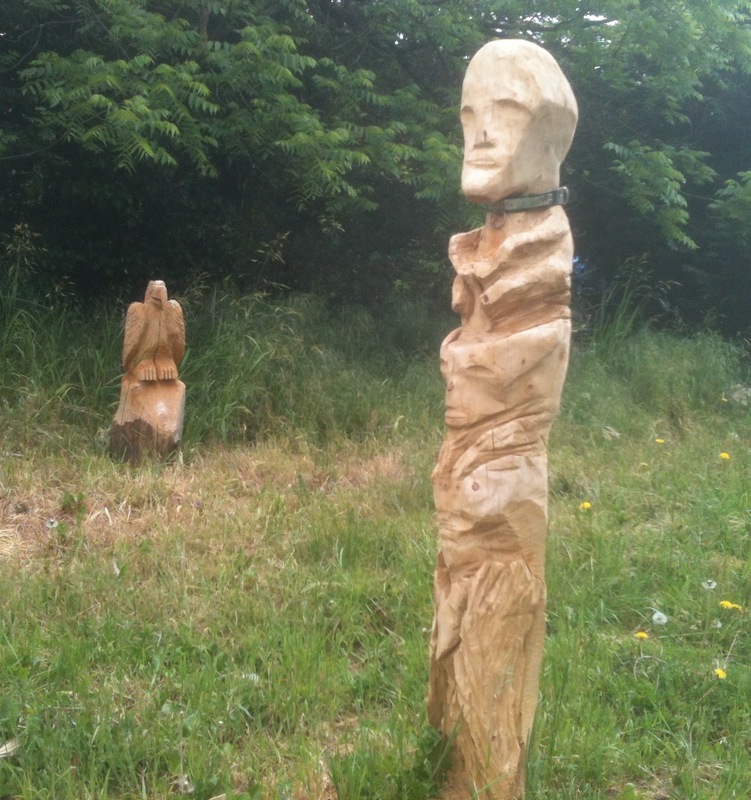 A carver’s camp of little know origin has sprung up at the intersection of N. Bryant St. and N. Montana Ave.
A few passes by the site never revealed the carvings creator or whether they’re for sale. 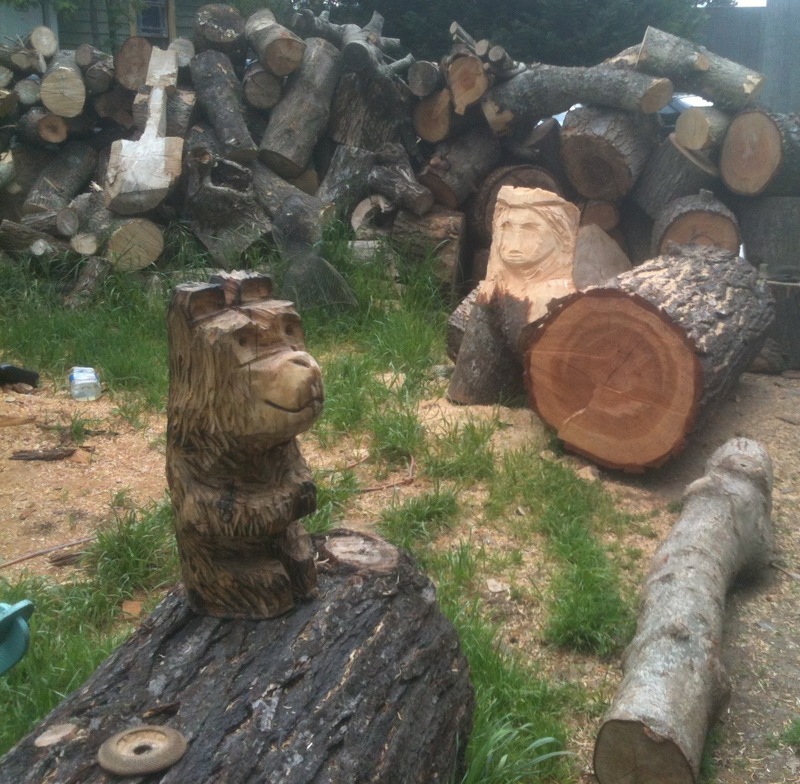 A conversation about chainsaws may have been the result of meeting the North Portland carver or perhaps a deeper understanding for the talent and inspiration behind the creation of this art from fireplace logs. The Portland Orbit’s crack investigation team seems more interested in doing crack than investigating something. A knock on the door of the house connected to the driveway may have provided a clue to the identity of the carver but the no trespassing signs may have proved too intimidating to follow this line of questioning. 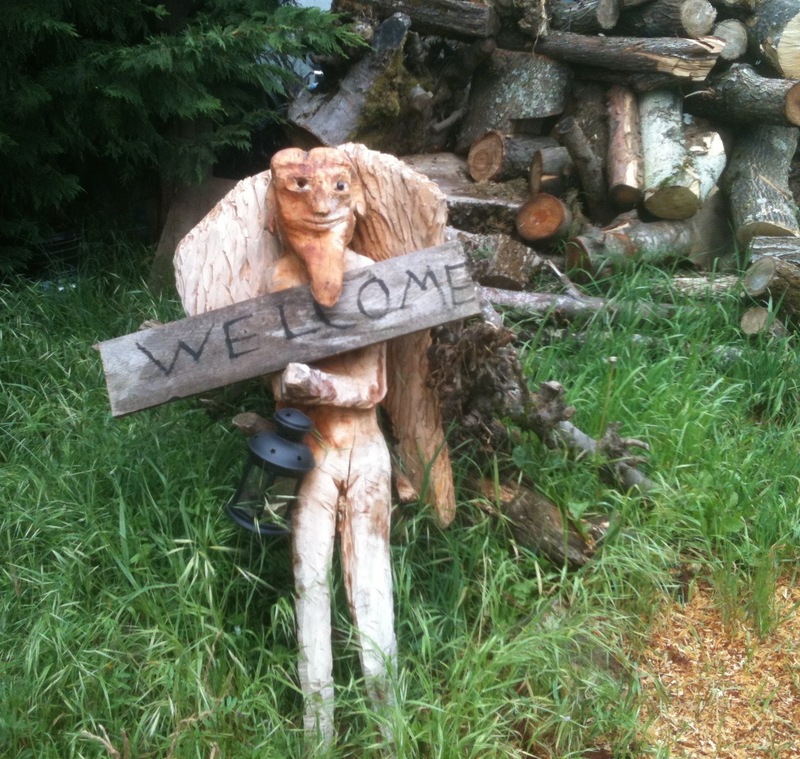 No matter the welcome sign hung across a particular wood sprite made it easy to spend time looking over the folksy, outdoorsy and crafty sculptures. 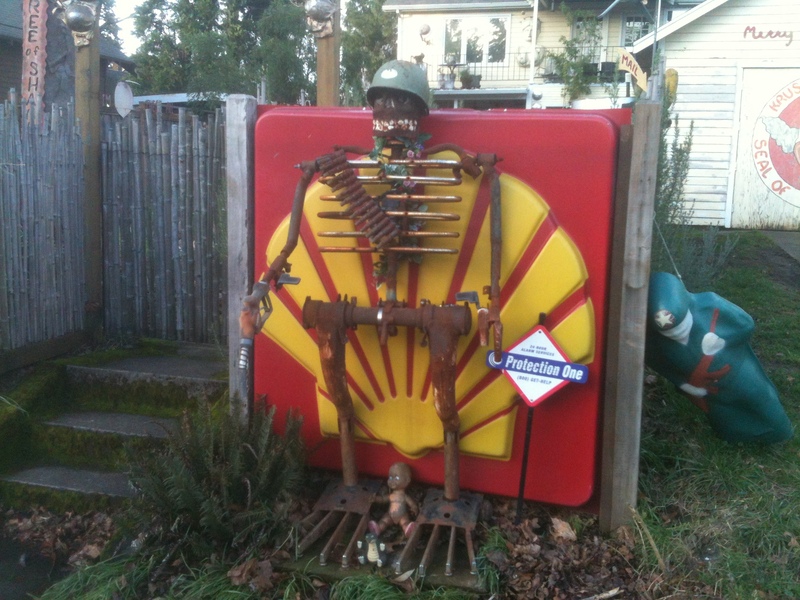 This is the kind of thing lovingly made fun of by the Pemco Insurance Company in their insightful profiles of people of the Northwest advertising campaign. As of the last couple of times I’ve ridden by the Carver’s Camp, I’ve noticed it’s been completely dismantled. There is no evidence that it existed. Only a sign that says something about slowing down for children is left. 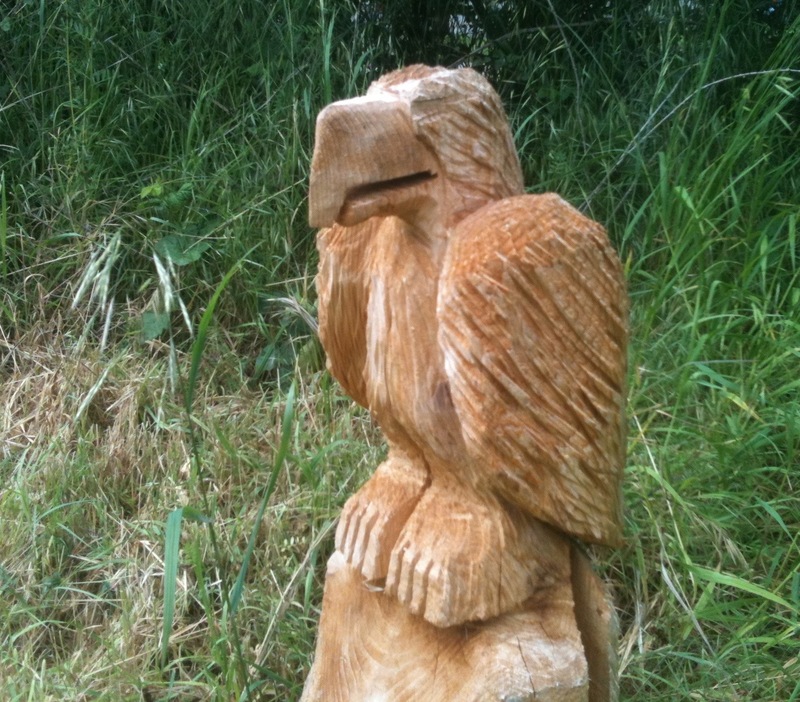 I’ve seen no logs or carvings. I throw this out to let anyone that might want to visit know. 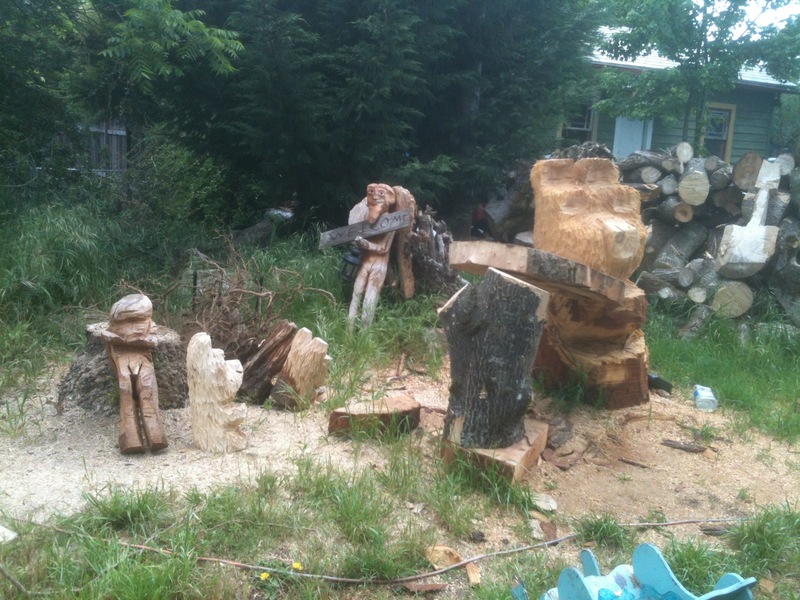 The only evidence of the wood carving in the area is a small bear sculpture in front of a house down the street from the camp on Montana Ave.
Fashionista scarecrow or Goddess mannequin yard art? It was difficult to tell. When I stopped on a misty afternoon to take her picture she gave me her best red carpet frozen pose but refused to answer my queries. She’s got the looks and grace of Taylor Swift dressed up to sign a recording contract extension. 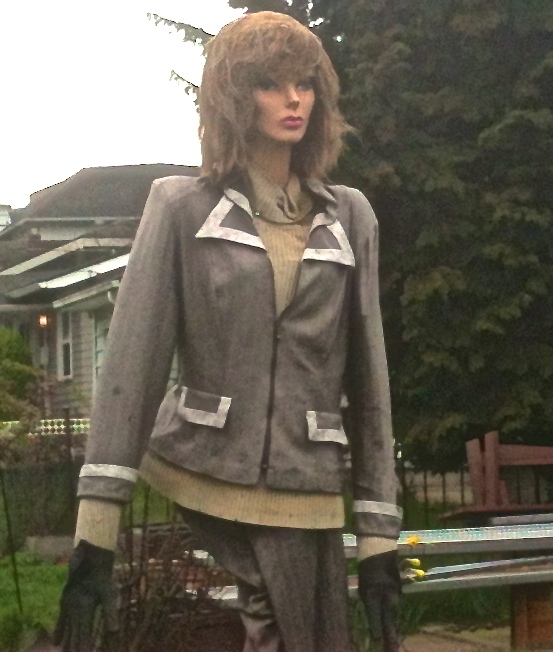 I’m not sure what’s propping her up but she stands tall and glamorous braving the elements in a Kenton neighborhood yard. 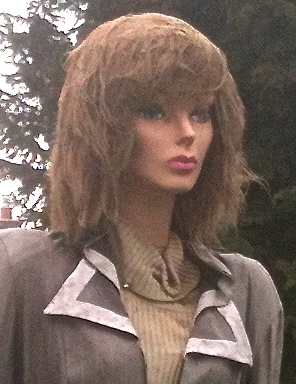 This decorative mannequin torso and head with her pants dangling and askew brought out my mannequin fever. Her head reminded me of a beauty academy practice hair head and I recalled the time a friend found two huge boxes of heads outside an Arlington, Virginia beauty academy. 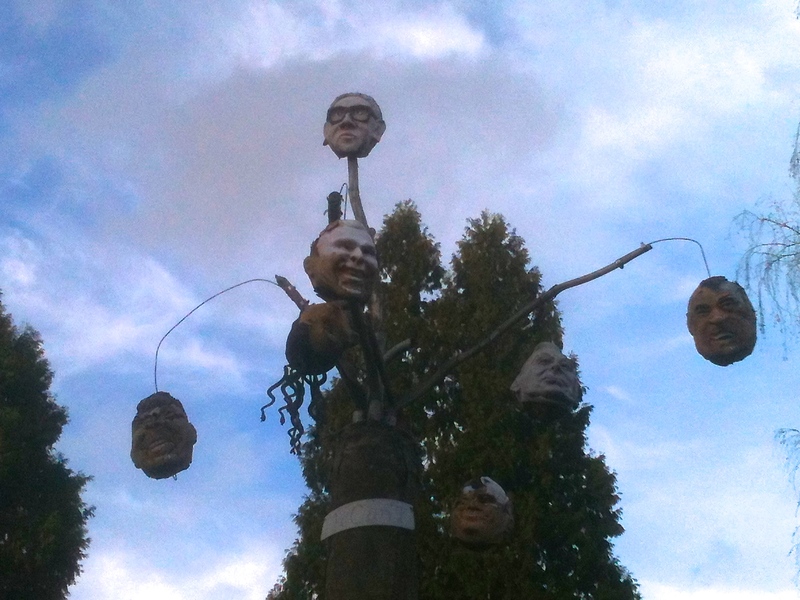 There were strange heads hanging around for years. 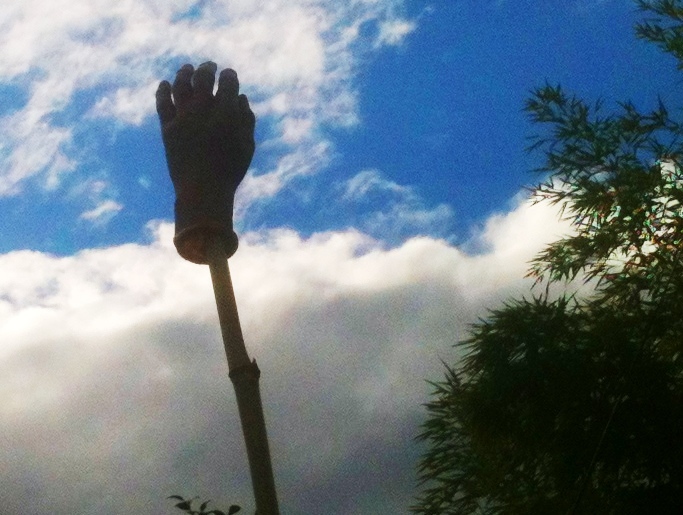 The things I get excited about are out of the ordinary decorations people have in their yards. 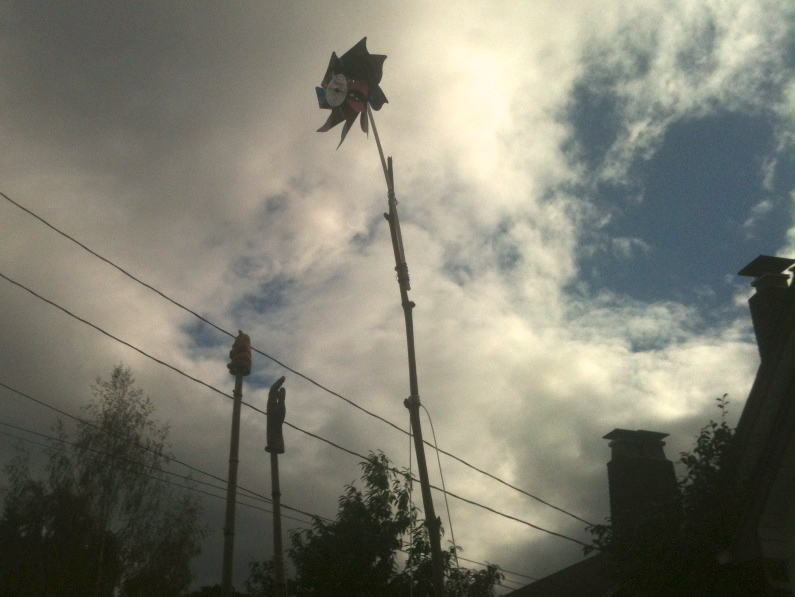 It doesn’t take much, just throw a pinwheel on top of your bamboo pole that you’re using as a frame for the netting that supports your pole bean plants. Then maybe top one off with a hand and hang an inviting sign. These photos were taken on N. Concord. 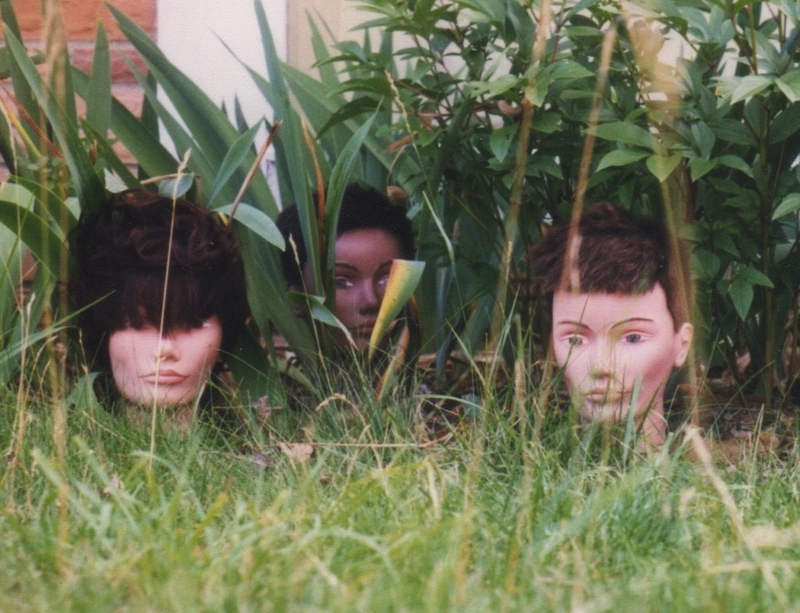 I’m always on the look out for yard art and would love to talk to people decorating the outside of their houses with a creative flair if anyone has neighbors or friends who are doing this let me know.